Family life has been radically transformed over the past three decades. One half of all households are unmarried, while only one quarter of all married households have kids. One third of the nation's births are to unwed mothers, and one third of America's married men earn less than their wives. With one half of all women cohabitating before they turn 30 and gay and lesbian couples settling down with increasing visibility, it is time for a book that tracks new conceptions of marriage and family as they are being formed. The editors of Marriage and Family: Perspectives and Complexities explore the motivation to marry and the role of matrimony in a diverse group of men and women. They compare empirical data from several emerging family types (single, coparent, gay and lesbian, among others) to studies of traditional nuclear families, and they consider the effect of public policy and recent economic developments on the practice of marriage and the stabilization—or destabilization—of family. 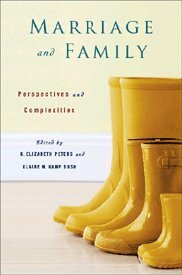 Approaching this topic from various perspectives, including historical, cross-cultural, gendered, demographic, sociobiological, and socialpsychological viewpoints, the editors highlight the complexity of the modern American family and the growing indeterminacy of its boundaries. Refusing to adhere to any one position, the editors provide an unbiased account of contemporary marriage and family.